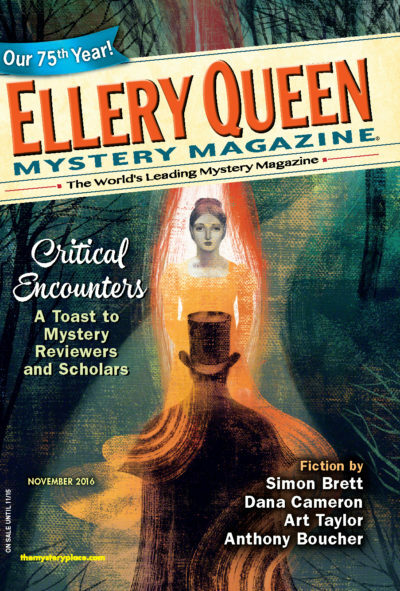 My shortest story yet in Ellery Queen’s Mystery Magazine also marks my first attempt at writing fiction inspired by Sherlock Holmes. The man himself isn’t mentioned directly, and I’ll admit to some purposeful blurring of any references here (there’s a Poirot nod as well), but whether those echoes succeed or not, I hope that “The Great Detective Reflects” might prove an effective bit of short fiction in its own right—contemplative at least, maybe with some heart underneath its head as well, and expressing throughout my love of so many iconic, cerebral sleuths. Such an honor to appear in this issue with Anthony Boucher (a short story from the archives! ), Simon Brett, Dana Cameron, Martin Edwards, Meg Opperman, and many more fine writers.